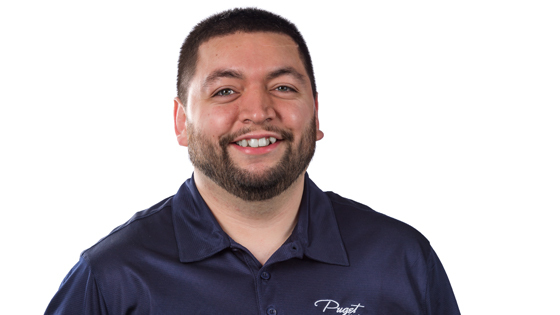 Ruben joined Puget Systems in 2008 as an Assembly Technician. He is now Senior Production Technician and our primary Quality Control (QC) Technician. Prior to joining the team, Ruben built several custom machines for himself, his family and friends. He says his experience working in a restaurant prior to Puget Systems helped him build important skills he uses every day, including attention to detail and customer service. Ruben says he wanted to work for Puget Systems because of the opportunities provided to get rooted and help cultivate the growth of the company. If you are looking for a laugh, Ruben always has a good "dad joke" to share. I would recommend using a Gold drive if it is important to have high capacity with good throughput that can actually be taken advantage of. These drives are noisy and have noticeable chatter when they're not in use. If storage is what's required get a Red drive, better acoustics and respectable performance. The things I like most about the Creative Sound Blaster Z is that it does not require additional power and that the front port audio/mic header is on the back of the card rather than the side. The thing I don't like about the Creative Sound Blaster Z is that it has a red LED that illuminates the general area where it is installed. I like the H110 and have appreciated the thermal advantage it provides to our systems. The pump is louder than the H60, though the small sacrifice in noise is made up by lower CPU temperatures. To make the most use out of Acoustipak use a caser made of sturdy material. A case with alot of holes for ventilation lets the noise from internal components escape easier. A door in the front of the case also helps to reduce the noise and more when the material can be applied to it. Loud parts can be dampened by Acoustipak, though it will not make them silent. I like the idea of being able to mount the ISK 110 to the back of a monitor, TV, or any other VESA supported mount as a media streaming platform. The ISK 110 also has a small footprint which can help make it easier to fit in areas with limited space. I'm usually not geared towards components that have a factory overclock, though EVGA has good support. The ACX line has lower acoustics when under load in comparison to founders edition cards. The heat from the card exhausts back into the chassis where other components like the CPU heatsink may cycle the hot air. Something to keep in mind though usually not an issue. The EVGA ACX GTX 1070 is a great card for many applications. I like the Red series drives from Western Digital. I use two of these 2TB drives in a RAID1 at home with a simple NAS box that sits on top of my desk and another in my day to day system for storage. The Red series drives are quieter under use since they only spin at 5400RPM and have respectable performance as well. I would recommend Red drives for someone who just needs large amounts of space to store their media or projects. With the addition of Fractal to our case line up we now have the ability to mount the H90 CPU cooler. The pump is similar to the H110 and does make more noise than the H60, though the H90 has more surface area for the radiator to spread the heat from the liquid coolant. I personally like the Arc Midi R2 the most out of our current line of Fractal cases. The side panels feel good and the front bezel has a clean look. I like how the front fans are attached to the front bezel for easy cleaning and the filters are also simple to remove from the chassis. The STRIX series cards have been an open armed welcome from ASUS. Even more so for the GTX 970 where the stock heatsink has loud cavitation noise. The STRIX series fans do not spin when under light use and are quieter under loads compared to reference cards. A great selection for quiet computing.